E-mail: jserena@cshore.com I fish happily for almost anything that swims, I enjoy gardening, and I edit books. I've recently moved to south-central Connecticut, my latest home in a peripatetic career. I'm blessed by a wonderful marriage. My wife Gloria, daughter Juliana, and I live in an old house with two good dogs, three lazy cats, and too many mice near the town of North Guilford. From Jeff: "This is just a slightly fancied-up gold-ribbed hare's ear nymph. Most of the time I carry a lot of flies, but I suppose I still catch more trout on hare's ears and woolly buggers than on all the rest of those flies put together. These days I tie most of my hare's ears flashback-style, with a strip of pearlescent Mylar for the wing case, but in 1988 I tied them with a wing case of brown turkey feather. I haven't seen Derbyshire hooks for sale for years. They were made in Redditch, England. The "Wet Fly" and "Down Eye" models were some of the best hooks I've ever used." In 1988 my father told me about the war. He had been a grunt, a private in the 302nd Regiment, 94th Infantry. The division landed over Utah Beach in Normandy after the invasion, fought in France and then across the Siegfried Line in the Moselle-Saar triangle in Germany. The 94th suffered 5,800 casualties in the war. My dad had never talked about the war. In a home where talking was important, where a conversation might careen from the quality of garden tomatoes to the art of Marcel Duchamp, the war simply wasn't a topic of discussion. It was a private place where Dad might have gone occasionally, but children were excluded. I moved to Santa Barbara in 1978 to further my schooling, but I was in South America in 1982 when my folks pulled up stakes and headed west, settling in Chico in the Sacramento Valley up north. After my return, my dad and I fished together once a year. I'd take my vacation in the spring or fall and drive the nine hours to Chico. There I'd spend a few days with my folks--my mom, just retired from a long career as a registered nurse, and my dad, who had retired from the production side of the newspaper business to tend the most astonishing garden I've ever seen on an acre of ground. Then my father and I would go fishing. He had a little camper on the back of a white Toyota pickup, and we'd drive to a campground for a week or so to fish Hat Creek or the Pit River, or maybe the upper Sac. Or my favorite, the McCloud. I tied flies for my dad. He could still tie, but age and glaucoma had taken away his ability to make the delicate little dries and nymphs I'd found in his fly boxes when I was a kid. He'd once been blessed with extraordinary eyesight. Now he tied big streamers and fanciful wets, and I filled out his fly boxes with the small stuff, tied during the slow afternoons between the morning and evening rises. In June 1988, at Ah-dee-nah Campground on the McCloud, I tied flies and asked my father to tell me about the war. He'd been trained as an anti-aircraft gunner, but the Luftwaffe was nearly beaten and that bad business in the Ardennes was making it hard to find enough infantry soldiers. So his whole unit was converted into foot soldiers, and he came up to the front on an overcast afternoon as a replacement for a dead man. At 4 o'clock the next morning his company attacked a German position on the edge of a small town. The Germans held hard. The fighting went on until dawn, and the enemy retreated. In the darkness my dad didn't know where the Germans were. He didn't fire his rifle. He couldn't tell what was going on in all that noise and confusion, much less see anything to shoot at. But in the cold morning light there were casualties, and the Germans were gone except for their dead. We walked down from the campground to the Nature Conservancy water right after sunup. A good breakfast, hot coffee, and anticipation quickened our pace and made it seem slow. We started at a plunge pool well below the streamkeeper's residence, a funky A-frame in paradise. I hooked a good rainbow right off, and it danced on the water. After noon, my dad's platoon advanced across a long, open field and into a forest. They moved into the trees and then the German artillery started up: 88s and rockets exploding in the tree tops. The platoon leader, a sergeant who assumed command when the lieutenant was hit in the morning firefight, was standing out in the open, finding cover for his soldiers. "You--get over here and get down, dammit! Keep your head down! Over here, get over here--get down right there--Get down!" The tree bursts rained shrapnel. My dad had run track in high school and was good in the middle distances. Now he ran again. He ran back out of the woods and threw himself into a shallow depression in the field beyond. The artillery barrage roared on for twenty minutes and then stopped. My dad got up and walked back up to his platoon. The sergeant had just finished calling roll. My dad hadn't been there to answer when his name was called. His sergeant was angry. "Where the hell have you been?" "Sarge, I got scared and I ran." The sergeant looked at him. "All right," he said, "but don't ever do that again." I hooked another fish on the swing. A fingerling came out of the water on the strike and came free from the hook. I laughed and my dad called down, "You get another one?" "Yeah, just a little one. He got off." My dad said, "They do that." On a morning in mid February the whole regiment lined up at first light and began moving forward through open woods and pastureland. Three thousand infantrymen in a line three miles across, division artillery and armor backing them up. My dad's platoon came up to the edge of a shallow ravine and a sniper opened fire from the other side. Everybody in the platoon dropped to the ground. A soldier off to the right was hit and started screaming, and the cry went up for a medic. My dad saw that the leaves in a little patch of brush across the ravine moved whenever the sniper fired. He carefully shot a whole clip from his M1 into the bush. The sniper stopped shooting and died. Forty-three years later, my dad said simply, "I killed that man." We walked down to the next pool, wading through the shallow water to get within easy range of the risers in the main flow on the far side. I got into casting position below a boulder and changed flies. "Dad, I think they're taking these little yellow mayflies." I waited as he fumbled, trying to tie on a PMD parachute almost too small for him to see. He finally used his magnifying glasses. I waited for him to cast and then I cast, too. I hooked a trout on my third or fourth drift along the current seam. It was a strong fish and took a little line downstream. The regiment was on the west bank of the Saar in late February. My dad's company got some canvas boats to cross to the other side at night. It was a reconnaissance. There weren't enough boats for everybody, so some platoons couldn't make the crossing. The rest got to the other side before the German machine guns opened fire. The American troops took a terrible beating. They couldn't get off the waterfront. My dad fired almost all his ammunition from the cover of a concrete wall. The Germans were dug in and wouldn't move. The surviving Americans retreated before daybreak, but my dad didn't get back to a boat. He and a fellow from another platoon hid on a barge that had been sunk on the river's edge by Allied fighter planes. It was half filled with rotting potatoes and river water. That night he and the other fellow decided to swim back across the river. It was cold and there was ice floating in the water. My dad was a strong swimmer and a stubborn man. He made it across, shivering uncontrollably as he pulled himself out on the other side. An American sentry challenged him, and my dad didn't know the password of the day. They finally let him through anyway. A lieutenant came up and told him that he was AWOL. My dad was cold and too angry to speak, so he brushed past the officer and walked back to an aid station where he got a blanket and hot coffee and some dry clothes. He never found out if the other fellow from the sunken barge made it across. I worked a big riser on the far side of the current seam, down and across. I suppose I made thirty or forty casts before the fish finally took, rolled at the surface, and came off. I said, "Sonofabitch." My dad, upstream from me, laughed and missed a strike. The 302nd was across the river before the end of the month. They pushed deeper into Germany and the Wehrmacht troops began surrendering. But not the SS troops. "You could always tell when you were fighting the SS. The regular German soldiers you could push back. But you couldn't push the SS troops back. You had to root them out and kill them, or call in artillery and kill them that way. They didn't want to surrender. One day we captured two of them at a farm. They were from the 6th Waffen SS division. That was the second time we'd fought that outfit. Jesus, they were tough. Some fellas from the Airborne were there and took the prisoners away. A few minutes later we heard shots. Those Airborne guys came back without the prisoners. They'd killed them. So I asked their sergeant, 'Geez, why did you do that?' He just shrugged." It was just a few days later when the Germans counterattacked as the 302nd advanced toward Dusseldorf. My dad's company held their line. They had a .30 caliber machine gun at the top of the perimeter in a foxhole, holding the Germans back. The machine gunners were taking heavy fire and were all wounded. My dad and another man were ordered forward to work the gun. "I didn't want to, but what are you going to do?" He ran across the open ground to the foxhole. "In the movies, bullets make whistling noises. It's not like that. A bullet that comes close to you makes a click as it goes by. It's a sharp clicking sound. Click, click, click, click." The other fellow didn't make it, but one of the wounded machine gunners, a sergeant, helped my dad with the gun. Finally an American tank came up and began firing its cannon at the Germans. They started pulling back. The tank drove right over the top of the foxhole. The American troops followed the tank forward, and the Germans broke and ran. The wounded sergeant had been hit in the belly. Some of his men came up and asked him what they should do. He said, "Please leave me alone." My dad told the men to shut up and leave the sergeant alone. "He was dying. All he wanted was a little peace and quiet." The hatch thinned out and my dad and I went over and sat on the bank. It was still early but we were hungry already and ate the ham sandwiches I'd made for lunch. We each had a beer. Sierra Nevada Pale Ale. God himself might have brewed that beer for the wedding at Canaan. After Germany surrendered my dad was promoted to sergeant and was put in command of an MP platoon in Bavaria. They were billeted in a lakeshore mansion that had been the home of the Bavarian governor. The platoon was mainly employed in searching for weapons and fugitive SS officers. On a street search one day they came to a house owned by an old man. My father had a gift for languages and had learned German. He told the man that they had to search the place. The old man began crying. My dad pushed past him and went in. The big room to the right of the entryway had built-in cabinets from floor to ceiling with wooden drawers. The drawers contained a vast collection of dead beetles, all pinned and labeled, from all over the world. The old man had been a professor of entomology, and the beetles were his life's work. My dad told the old man that they wouldn't harm his collection, and then reported to the company commander. The captain posted a 24-hour guard on the house to make sure no one would hurt the old man's beetles. After lunch, my dad started nymphing a short run just below a little gravel bar. I fished downstream and caught two nice rainbows on a small woolly bugger. An hour or so passed, the fish stopped hitting, and I walked back up and met my dad coming down. He'd caught a big fish while I was away, and he wanted to tell me about it. "I used one of your nymphs--this one." 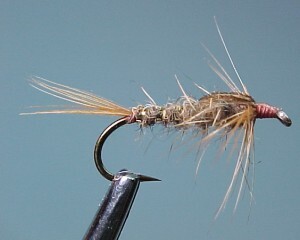 He showed me the fly, a #12 dark hare's ear on a 2x-long hook, still tied to his tippet. My dad didn't have anything to measure the fish with, so he'd broken a twig from a streamside bush while he revived the trout. He trimmed the twig to the length of the fish. "That's how long the fish was," he said, handing me the twig. I measured it against the inch marks painted on my fly rod. Twenty inches and a little more. Back at the campground, late that afternoon, my dad took a bad fall down the bank and ripped his waders. I might have repaired the tear, but my old man was tired and bruised, and I reckoned we ought to head back to Chico. He said he'd like to stay if I wanted to keep fishing, but it was time to go home. That was the last time I fished with my father. My wife and I moved to Colorado, my dad got sick, and although the chemo held off the leukemia for a time, he never fully recovered and the disease eventually came back and killed him. My mom and I were with him when he died at home in Chico in 1995, just a few days after his birthday. He was barely conscious when I thanked him for teaching me how to fish, and I don't know if he heard me or not.